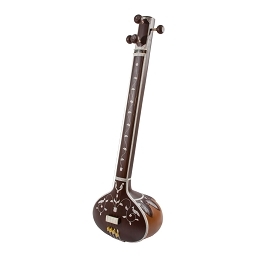 The tambura is a long necked plucked lute, a stringed instrument found in different versions in different places. 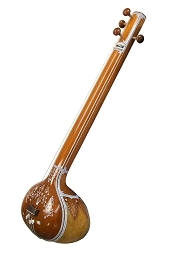 The tambura (South India), tamburo (Gujarati), or tanpura (North India) in its bodily shape somewhat resembles the sitar, but it has no frets, as only the open strings are played as a harmonic accompaniment to the other musicians. It has four or five (rarely, six) wire strings, which are plucked one after another in a regular pattern to create a harmonic resonance on the basic note (bourdon or drone function). 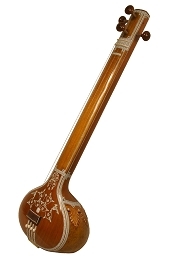 Tanpuras come in different sizes and pitches: bigger "males" and smaller "females" for vocalists and yet a smaller version that is used for accompanying sitar or sarod, called tamburi or tanpuri. Male vocalists pitch their tonic note (Sa) to about C#, female singers usually a fifth higher. The male instrument has an open string length of approx. one metre, the female is sized down to 3/4. The standard tuning is 5881, sol do' do' do, or in Indian sargam: PA sa sa SA. For ragas that omit the fifth, the first string will be tuned down to the natural fourth: 4881 or Ma sa sa Sa. Some ragas require a less common tuning with shuddh NI (semitone below octave sa) : NI sa sa SA. With a five-string instrument, the seventh or NI (natural minor or major 7th) is added: PA NI sa sa SA (57881)or MA NI sa sa SA (47881). The name 'tanpura' is probably derived from tana, referring to a musical phrase, and pura which means "full" or "complete". 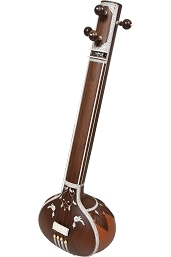 Both in its musical function and how it works, the tanpura is a unique instrument in many ways. It does not partake in the melodic part of the music but it supports and sustains the melody by providing a very colourful and dynamic harmonic resonance field based on one precise tone, the basic note or key-note. The special overtone-rich sound is achieved by applying the principle of jivari which creates a sustained, "buzzing" sound in which particular harmonics will resonate with focused clarity. 'Jiva' refers to 'soul', that which gives life. 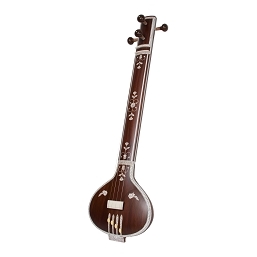 What is implied is that an 'animated' tone-quality is the idea which the tanpura embodies. The principle of jivari can be likened to the prismatic refraction of white light into the colours of the rainbow, as its acoustic twin-principle at work. To achieve this effect, the strings pass over a wide, arched bridge-piece, the front of the bridge sloping gently away from under the strings. When the string is plucked, it will have an intermittent periodical contact with the bridge at a point close to the front edge. This intermittent grazing of string and bridge is not a static process, as the points of contact will gradually shift, being a compound function of amplitude and the curvature of the bridge and string tension. When the string is plucked it has a large amplitude, moving up and down and contacting the bridge on the down-phase. As the energy of the string's movement gradually diminishes, the contact point of the string with the bridge slowly creeps up the slope to the top of the bridge toward point zero when the string has finally come to rest. (depending on scale and pitch, this can take between 3 and 10 seconds) This dynamic sonic process can be fine-tuned using a cotton thread between string and bridge. By shifting the thread minutely, the whole dynamic process of the grazing contact is also shifted to a different position on the bridge, thus changing the harmonic content. Every single string produces its own cascading range of harmonics and at the same time builds up a particular resonance. Evidently, this generates a diversity of harmonic possibilities. According to this refined principle tanpuras are most attentively tuned to achieve a particular tonal shade in function of the intonation-related qualities of the raga. These more delicate aspects of tuning are directly related to what Indian musicians call 'raga svaroop', which is about how very characteristic intonations strengthen the tonal impression of a particular raga. 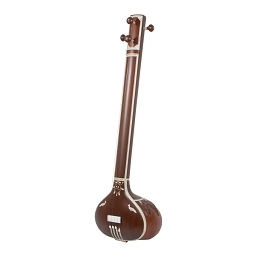 The particular set-up of the tanpura with the adjustable sonic-prismatic function of curved bridge and thread made it possible to explore a multitude of harmonic relations produced by the subtle harmonic interplay of four strings. Theoretically, at least, this is what the instrument was designed to do. However, it seems that this degree of artistry is slowly being eclipsed by the common use of the readily accessible electronic tanpura, which is not capable of this natural diversity as it produces one 'standard' sound per setting.